Purple Hair Dye There are 63 products. Do you love pastel purple shades? Want something that can totally transform your mane into a vibrant sea of sweetness? Then you’re sure to love our amazing collection of lilac hair color! Perfect for adding a splash of subtle candy color to your hair, our range of best lilac hair dye is guaranteed to transform your ‘do in an instant, so why not step over to the light side and add some candy colored magic to your tresses? In recent years, lilac hair has become an incredibly popular color choice, with celebrity fashionistas including Katy Perry, Kelly Osbourne and Nicole Richie all favouring lilac hair colour. Plus, with soft shades of violet, lavender and smokey lilac all rocking the fashion world, there’s never been a better or trendier time to try out a pastel purple shade. With such a phenomenal selection of lilac hair dye semi permanent available, you don’t need to search high and low for the best lilac hair dye on the market, we’ve got it all under one roof! If you aren’t ready for lilac hair dye permanent then temporary color can be a great way to test the waters. If you love your new color you can always come back for more but if you prefer to be a hair chameleon then why not choose hair dyes that wash out. Firstly, it’s important to remember that in order to achieve the prettiest pastel purple result possible you should apply your chosen lilac hair dye to hair that’s been pre-lightened to a level 9 or 10. Pastel dyes are designed for application on white or blonde hair, so if you’re a redhead or brunette, you’ll have to reach for the bleach in order to get a proper pastelised look. The lighter your hair is, the truer the color result you’ll achieve! Secondly, it’s essential to use toner on your hair to remove any brassy tones. This preparatory step will mean that your hair has an even and light base shade, making it a better ‘canvas’ for applying your lilac hair color onto. Lastly, make sure that you’ve had any dead or split ends snipped off and that you’ve used a nourishing intensive conditioner to rehydrate your locks. Comb your hair and part on your preferred side. Next, apply a thin layer of petroleum jelly around your hairline and in and around your ears to prevent staining. Wash your hands, then pop on a pair of disposable gloves to keep your hands protected. Using a tint brush, begin to apply color to the roots of your hair, beginning at your parting. Using the end of the tint brush, section your hair every inch or so and apply color to both sides of the section. Work in one direction all the way to your ear, then go back and do the other side. Once the roots are done, begin to apply color to your hairline, beginning in the middle and working around the head until you reach your starting point. Make sure you apply the color with a steady hand, as dye drips aren’t a great look! Now it’s time to color the lengths! Work in sections and bring the dye down through your hair, working from root to tip until each section is fully saturated with dye. Repeat until you have full head coverage, then pop on a plastic development cap to trap the heat in and speed up the development process. Allow the color to develop for the time stated on the dye packaging, then remove the cap and rinse the color out using cool water. Once the hair is free of dye, you can dry and style as normal. And there you have it, our complete guide to getting a stunning result with lilac hair dye! No matter whether you opt for a solid application, a lilac hair ombre look or a two tone style such as lilac and silver hair, you can be sure to achieve pastel perfection with our gorgeous range of lilac hair color dyes! When it comes to unnatural hair shades, pastel passion is still going strong and there is no shade quite so alluring as lavender hair color. For those who want to achieve an other-worldly, unnatural hair color that subtly mesmerises, pastel hair dye is the way forward. Plenty of celebs have tried out this soft shade of purple. Actress, Anna Paquin showed off her Instagram worthy lavender locks and we absolutely loved them. Demi Lovato opted for a punk vibe with her new purple ‘do, blending it with other shades of blue and pink. Her rainbow hairstyle can be easily achieved at home by sectioning off your hair before you apply your dye. Nicole Richie was also spotted sporting a short lavender style, proving that this color can be both fun and sophisticated. If you want the best lavender hair dye that will give you the understated, smoky color of your dreams, trust us when we say that semi-permanent products are the only way to get a true pastel shade outside of the salon. 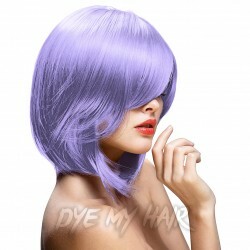 Semi-permanent lavender hair color coats and tints the hair shaft without chemically altering your color. Of course, you will have to lighten your hair with a bleaching treatment before a semi-permanent dye can give you the pastel shade you want. If you leave your hair one to two weeks between bleaching treatments, it should have enough time to recover. Just remember to give your tresses some serious TLC while you’re waiting. Deeply condition your hair to make sure it is as strong and healthy as possible for applying bleach and hair dye. To achieve a true pastel ‘do, you will need to make sure your hair is as light as possible so your natural darker color doesn’t show through. You may also want to consider using toner on your hair to neutralize the brassy tones that the bleach will have left behind. Starting with a blank canvas is the best way to achieve a gorgeous lavender hue. In the event that your lightened hair is not pale enough to use pastel hair dye, all is not lost! Try a dusty purple hair dye for dark hair in a deeper shade, such as Manic Panic’s Amplified Semi-Permanent Hair dye in Deep Purple dream. This gorgeous lilac hair dye is dark enough to cover light brown or yellow hair, while still having the smoky undertones of its lighter, lavender counterpart. One final top-tip, if your hair requires a lot of lightening and you’re going for a different pale shade such as pastel pink hair dye, be patient and use a semi-permanent lavender hair color first. If bleaching your hair has left even a hint of yellow or orange, pastel pink hair dye simply will not cover it. Instead, you’ll find the brassy tones in your hair blend with the pink to create a rose-gold color, which might be rather beautiful - but it isn’t what you’re going for. We recommend using the palest semi-permanent lavender dye you can lay your hands on (we love Manic Panic Creamtones Perfect Pastel Hair in Velvet Violet) to neutralise the golden tones. Then you can apply your chosen pastel hair dye once the purple has faded out to get the look you want. It might be impossible to make extremely light or bright purple hair dye permanent, but there is a lot we can do to make it long-lasting. Pastel hair dye requires a fair amount of maintenance to keep it looking good – but it’s so worth it! Choose the best lavender hair dye for hair-health, like La Riche Directions Wisteria or Lilac Hair dye. These wonderful chemical-free conditioning dyes moisturize the hair as they color it. You’ll be caring for your hair every time you top up your shade. Plenty of our other brands at Dye My Hair, have these same conditioning qualities so make sure to do your brands research before buying. Find yourself a color preserving shampoo. This will keep the amount of color you loose with each wash to a minimum. We stock shampoos and conditioners here at Dye My Hair so you can buy all your products in one place. We would also recommend washing your hair less frequently and in cool water where possible. Use an old hair dye pot or jar to blend one of your favourite lavender hair color brands with your usual conditioner. Every time you condition your hair, you’ll be subtly enhancing your color, keeping it fresh and bright. Try to avoid using heat on your hair by letting your hair air dry and by styling it without hair straighteners or curling tongs. This will help lock in that gorgeous lavender color. Keep some hair dye for later. Save some color for topping up your roots so you can keep your fabulous new style for longer. If you’re not sure which shade you want to go for, check out our range of semi-permanent lavender hair color brands. We’ve got everything you need for pastel-perfection. Thinking what new hair colour to try next? Have you thought about testing some gorgeous violet hair dye? Violet is a color that can work with all types of natural hair colors and is available from light purple hair dye to dark violet hair color; it is the perfect color for adding a splash of fantasy and sweetness to your look! The colour purple is an uncommon color in nature and as a result lavender, orchid, lilac, and violet flowers are considered to be precious. Purple combines the peaceful constancy of blue and the strong power of red. The color purple is often associated with luxury, ambition, royalty, nobility, power, wisdom and elegance. Purple has also been known to hold connotations of dignity, grandeur, extravagance, wealth, pride, peace, magic, mystery and independence. Which Shade of Violet Hair Color Dye Will Work for You? Natural Violet Hair Dye –Having very light purple hair or natural looking violet hair is very popular at the moment with celebrities, notably the singer Katy Perry. The pastel shades ensure an elegant and feminine look that adapts really well to light hair colors such as blonde and white. With products such as La Riche Directions Semi-Permanent Hair Dye (Lilac), Crazy Color Semi-Permanent Hair Dye (Lilac), Manic Panic Creamtones Perfect Pastel Hair Dye (Velvet Violet) or Herman's Amazing Semi-Permanent Hair Dye (Vicky Violet) you’ll be able to adopt this cool new look in no time. Stars such as Kelly Osbourne, Nicole Richie, Alexis Michelle and Nicki Minaj have all played with natural violet hair tones to create sweet and subtle purple hairstyles. Mystic Violet Hair Dye – If you are looking to go for a dark violet hair color, then the strong shades of the Crazy Color Semi-Permanent Hair Dye Hot Purple and Violette are definitely perfect for you. As well as La Riche Directions Semi-Permanent Hair Dye in Plum Purple. The mystic violet shades offer a rich color which gives a strong and stylish finish. Many celebrities have opted for a full on violet hair color for its theatrical appeal. You will have no doubt noticed Demi Lovato, Wiz Khalifa and Azealia Banks experimenting with these dark mystic violet undertones and although one of the darker shades of purple, you’ll have to agree that it’s definitely a look worth maintaining! With such an exceptional range of semi-permanent violet and purple hair color available, you don’t need to search through the stores for the best violet hair dye on the market, we’ve got it all here for you, at prices that won't break the bank! Achieving and maintaining a complete violet hair dye look on dark hair can be a bit of a struggle if you don't follow the right steps; it’s certainly an exceptional look for those of you willing to work for it! If you are ready to rock violet black hair dye, we’ve compiled a few handy tips for making the royal color work for you. Preparation – when dying your hair an alternative color such as purple or violet, which involves bleaching, it is important to protect the impact the color will have on your hair through thorough conditioning and strengthening. The bleach may weaken the hair, so it is important to use keratin and protein-based products as part of your preparation. Bleaching – lightening your hair creates a blank canvas on which the colored dye can be more easily applied than to dark. It is desirable to lighten hair to a level 9-10 to ensure your natural hair color does not impact the results of the purple shade. Violet hair dye for dark hair without bleach is a difficult task, so make sure to do your research before coloring and test the bleach product on your skin before a full head application. Toning – using a hair toner is a great way of removing any residual brassiness from your hair color. Using toner products ensures your chosen color ends up the way you want them, without any stubborn underlying tones – we want your new violet hair tone to look its best! After this process, it is completely up to you how you put on your hair dye. Before you begin applying your dye, it is essential to test possible shades for at least 48 hours. 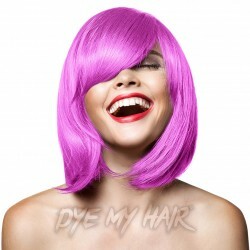 This ensures that you are happy with the color before you cover your head in semi-permanent violet hair dye and gives you the time to change to a different shade. Always ensure you know what you are doing before you start, dyeing hair is a task that requires practice and precision. Ask your hairdresser, hair stylist, friends and family for any tips and tricks when dyeing hair at home, it can be risky business when dealing with intense violet hair dye. If it is your first time, ask someone to help you! If you want some inspiration for violet hair dye, why not check out our social media channels? With plenty of images of violet hair dye ideas, you’ll definitely find something which you will want to recreate! Feeling blue? If you feel that your current wardrobe style is lacking depth, try spicing it up with indigo hair dye to add another, deep and dark dimension. Dark, glossy blue and purple shades look fantastic with most complexions and are easy to achieve on both dark and light natural hair colors when you know how. Dark shades like indigo are also easier to match with clothes compared to bright, fluorescent shades like yellow, pink and green. Blue and purple go well with white, silver, gold, green and brown as well as black, blue and purple. Blue hair has been loved and admired since the ancient times when the Egyptians worshipped their gods who had hair the color of Lapis Lazuli, a semi-precious dark blue rock. In more recent times, blue hair has been a popular phenomenon since the beginning of the 20th century, when a trend started in Paris for vibrant colored hair of violet, emerald and deep blue in 1913. You can create many different styles with indigo dye, from dark winter blue shades to purple/violet indigo shades that perfectly match floral summer dresses in a vintage way. Use streaks of blue and purple in natural black or brunette hair, or bleach your hair first to create an all-over, unmissable shade. Electric blue with dark indigo low-lights is a feminine yet edgy look too. Keep reading to find where to buy indigo hair dye below. We think that straight or sleek hairstyles best suit deep purple hair dye shades as it adds another depth to the color but whatever style you decide to go with, we’re sure you’ll look fab! Dyeing hair blue takes guts, especially when you pick such a dark shade like Indigo! Follow the lead of these 3 strong women who weren’t afraid to take a plunge. Game of Thrones star Maisie Williams is a lot more glamorous than Arya Stark! She recently changed her short brown hair to indigo hair with semi-permanent blue hair dye. She dyed her hair a dark blue color, adding sections of black to create an inky look. Katy Perry has had a lot of different hairstyles over the years, but one style that lasted longer than her vibrant wigs was a dark, indigo blue hairstyle. She dyed her hair a dark blue color that you can easily replicate at home, but why not add streaks of deep purple hair dye to give it some individuality? Finally, let’s not forget Jessie J. The British singer has rocked indigo hair a few times when it’s not her usual sharp bob that’s fully dyed blue, she’s dip dyeing her brunette ends with dark purple hair dye to create an indigo hair look. Where to Buy Indigo Hair Dye? There are lots of fantastic hair dye brands available so pick your favorites from this top 3 list and give them a go. Mix and match with streaks or opt for a beautiful ombre look. 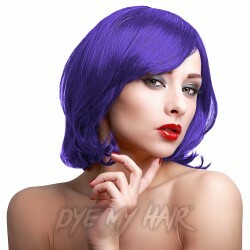 For indigo hair that’s closer to purple than blue, try Crazy Color Hot Purple or Violette shades. Hot purple is a lighter indigo shade, a delightful mix of electric blue and classic purple. Violette, on the other hand, is delightfully dark and cool, similar to their Aubergine shade but with a dash more blue. For natural indigo hair dye, look no further than Manic Panic. This hair dye is vegan friendly and easy to apply. After Midnight is a vibrant dark blue shade that reminds us of the sky on a dark, clear night. If you’re looking for a shade that’s closer to purple, you’re spoilt for choice! Deep Purple Dream, Violet Night and Plum Passion are all lovely. 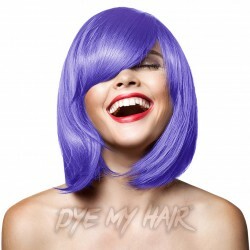 La Riche Directions semi permanent blue hair dye and deep blue shades is especially popular. We’re particularly fond of Atlantic Blue and Plum Purple shades. If you want to mix and match La Riche Directions, try the Atlantic Blue with Midnight Blue and Plum Purple with Dark Tulip for a warmer shade. Without the proper care and method, you could end up with a mess of hair rather than a sleek indigo hair color. Start by buying all the equipment you need before you begin: bleach, semi-permanent blue hair dye, applicators, mixing bowl and special hair care products. It’s also not a bad idea to buy a cheap towel especially for when you dye hair, so you don’t end up staining your everyday towel. If you want a true, solid indigo blue dye color you’ll need to bleach your hair to level 9 or 10 lightness – even if you’re just doing a dip dye. If you have dark hair and are looking for more of a hair tint, you can skip this step for a more subtle color. Follow the packet instructions, starting with a test patch, then take your time dyeing your hair, making sure every strand is evenly coated. Once your hair is looking beautiful, inky and indigo, style it and keep using your protein rich, keratin strong hair products to keep the color vibrant for as long as possible. We think you are going to enjoy showing off your new indigo hair dye. Once you’ve mastered this color, it might be time to try a new color or add another shade to your hair. Try emerald greens or a contrasting, luminescent yellow! Thinking of trying plum hair dye and want to know a little more about it? Here’s a quick tour of all our style know-how, color knowledge and application tips and tricks to get you started with plum purple hair dye. Choosing the right hair color can be a difficult decision. It’s particularly risky because it’s not as simple as changing your hairstyle where if it doesn’t look right you can just play around with it until you find a style that does. We always think the first step is to get some real color inspiration. Plenty of stars and celebs have enjoyed trying out everything from deep purple to burgundy plum hair color. Stars like Justine Skye rocked a ripe plum tone to the Vogue Fashion Awards and stole the show, as well as Vivica A. Fox who went all out with a head of tumbling sangria-soaked curls. Even stars such as Jamie King, Nicole Richie, Irene Kim and Missy Elliot have dabbled with plum ombre, balayage and highlights – so what’s to stop you from having a go? 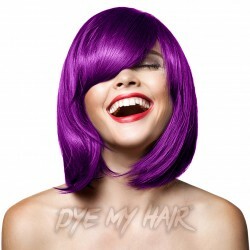 La Riche Directions Plum Semi-Permanent Hair Dye: This purple hair dye is really bold! If you are the eccentric type then this definitely is for you. It’s a great color for people with hazel or brown eyes and it also looks really good with a cool skin tone. Stargazer Eggplant Semi-Permanent Hair Dye: Eggplant might not be your favourite thing to eat but it’s got a great color to it. It looks good with all eye colors but works best with cool and olive skin tones. Manic Panic Fuchsia Shock High Voltage Semi-Permanent Hair Dye: This color is high on our list for plum hair dye semi permanent. It looks great with hazel or blue eyes and a warm skin tone. La Riche Directions Lilac Semi-Permanent Hair Dye: This color has a strong rose-gold undertone which places it at the warmer end of the color spectrum. This color looks really awesome on people with olive and warm skin tones no matter what eye color you have. Manic Panic Plum Passion High Voltage Semi-Permanent Hair Dye: If you are looking for a subtle but cool color, this is for you. This color blends well with black hair making it the perfect plum hair dye for dark hair. If you have an olive skin tone this color will look superb on you no matter what eye color you have. Splat Sugar Plum Temporary Hair Color Chalk: This color is a blend of both cool and warm tones. However, the dominant rose-gold undertone pair’s best with light eyes and a warm skin tone. This is the perfect red violet hair color. Wait for 2 days: After you have colored your hair, wait for two days before washing it. Don’t wash your hair too much: Wash your hair two to three times per week. Color safe dry shampoo: On the days that you don’t wash your hair use a color safe dry shampoo. Wear a shower cap: When you are not washing your hair, wear a shower cap in the shower to keep your hair from getting wet. Don’t forget to take extra care of your locks with your new purple hair dye. You want to avoid your hair become damaged, dry and frizzy so make sure you condition and treat it well and get regular trims or cuts. Your skin tone plays a big part in choosing the right plum purple hair dye. One way of checking your skin tone is to go out into the daylight and look at the inside of your arms. If your veins are purple or blue, your skin tone is cool. If your veins are green, you have a warm skin tone. Eye Color is equally as important when it comes to picking the perfect new hair color for you. We have plenty of suggested matches ready and waiting if you’re considering plum dye. Hazel eyes are always sure to look good with a wide range of deep plum hair color regardless of the tone of your eyes. Plum colors with a warm undertone look best on people who have blue and grey eyes. As you can see there are plenty of shades and styles to choose from within plum hair dye so you are sure to be able to find the perfect purple shade for you. With a little bit of care, your hair will look healthy, shiny and gorgeously plum. If you have never dyed your hair at home, you can see that it isn’t as scary and difficult as you thought so dare to try something new this year. Don't settle for normal hair colours, get the La Riche Directions Semi-Permanent Hair Dye in Lilac! If you want a hair colour that will turn some heads, we really can't recommend the La Riche Directions Semi-Permanent Hair Dye in Lavender enough! Switch up your style with the sumptuous shades of the Manic Panic High Voltage Classic Cream Formula Colour Hair Dye in Purple Haze! Looking good has never been easier thanks to the Manic Panic Amplified Semi-Permanent Hair Dye in Ultra Violet! Achieve a bold and striking look with this glorious shade of Manic Panic High Voltage Classic Cream Formula Colour Hair Dye in Electric Amethyst! Find pastel perfection with Manic Panic High Voltage Classic Cream Formula Colour Hair Dye in Lie Locks! A must-have shade for your hair! Stand out from the crowd by going a shade bolder with this awesome Manic Panic High Voltage Classic Cream Formula Colour Hair Dye in Mystic Heather! It's just too easy to fall in love with the delectable shade of Crazy Color Semi-Permanent Hair Dye in Lavender! Achieve a sweet and sassy look with this temporary hair dye.